If your idea of a holiday is being at a place far off from the mainstream stress of dailylife, head to Café Cherrapunjee Resort. Situtated halfway from Shillong to Cherrapunjee, the hotel is a perfect gateway for a relaxing holiday. Dont expect your 5 star facilities. The staffs are the local people of Sohra who are not hotel management grads but have a genuine touch of hospitality. The food has authentic local touch and served fresh and hot at a time you expect it. 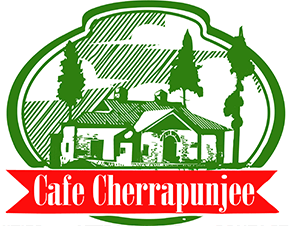 Cafe Cherrapunjee is set amid ancient pine trees in a beautiful property in Mawkdok, Meghalaya. Its restaurant features authentic local cuisine as well as Indian food served in a fine dining set up. The cafe is a perfect stop for a wonderful midway meal while on way to Cherrapunjee from Shillong. Accommodations are available for those wishing to experience living closer to nature and the rain this area is famous for world over. A 125 year old ‘Dak Bungalow’ converted into a restaurant is the dominating structure and main attraction of the place. The structure dates back to the time of the British Raaj in India. It was used as a post office and was one of the many dak bungalows where official horses were changed while enroute from Dhaka to Assam. Reuters’ reports states that in the 1960s, an un identified flying object was also seen hovering over the property. This adds to the history and mystery of this wonderful property.